Focusrite has released the Liquid 4PRE's Pro Tools TDM/RTAS control plug-in. The plug-in can operate alongside Liquid 4PRE's standalone control application 'Liquid4Control', and provides integrated remote control via Pro Tools software and hardware, including Icon and Venue systems. 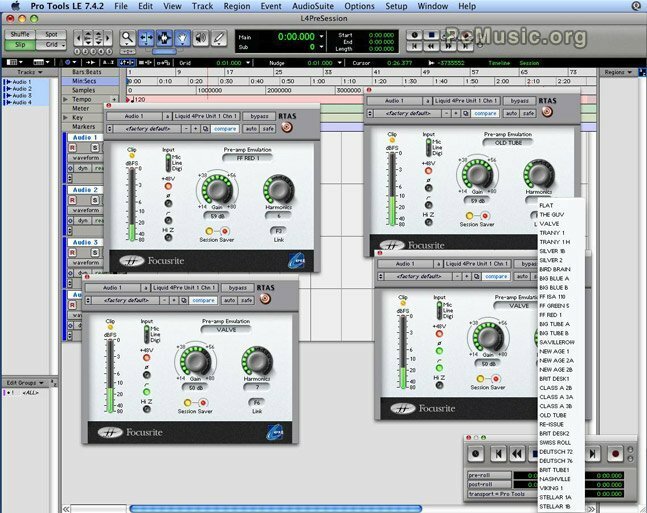 As a Pro Tools TDM/RTAS plug-in, it brings a host of other benefits, including comprehensive automation and session integration. This enables, for example, automated gain control of all four pre-amps and full recall of all pre-amp settings (including emulation choice), as part of the Pro Tools session. The Liquid 4PRE four-channel microphone pre-amplifier utilizes the Liquid Channel's proven Liquid technology, marrying a hugely flexible analogue front end with cutting-edge dynamic convolution DSP to deliver the sounds of 40 vintage and classic microphone pre-amplifiers across all four channels. The Liquid 4PRE Pro Tools TDM/RTAS control plug-in is available to download.